‘ ’I was born in Austria, back in the mists of time, to a Welsh-Lancastrian Father and an Austrian Mother. A wonderful mixture as it turned out for me! I came to live in Wales with my parents at an early age and we travelled to many areas, giving me many lessons and insights over the years. I now live in West Wales, with my family, on a beautiful smallholding, near Carmarthen and have done for some years, my- how time really does fly! The fresh air and country life is invigorating and has helped me to evolve the way I have. It has been a life-long dream to help others and I always had a deep interest in self-development, spending many happy hours reading, writing, studying and gaining knowledge in a wide range of subjects, both academic and holistic. All the things I have learned make me who I am. After a very stressful period in my life, I took some time out for myself, finding this was my turning point. I was forced to re-think my way of life and make changes. I found the joy of Reiki and felt the fulfilment and release it brings in all things mental, spiritual, physical and emotional. This became one very important way to help myself, and then others, to deal with excessive stresses and the dis-eases in life. 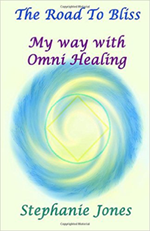 Omni Healing found me when I was ready to progress and, in gratitude, I was initiated, guided and attuned by Dr Sameer Kale, Shivananda, from Bhopal, India. I am a Master Teacher of Omni Healing, Master Teacher of Omni Kriya (Energy Massage Therapy) and Master Teacher of Usui Reiki. Also, I am a Master Healer of Omni Sutra, Omni Saisutra, Omni Anugrah and am a Teacher and Practitioner of Colour Breathing™, a Senior Practitioner of Omni Saitva, Practitioner of Omni Shiva (Rudraksha Therapy), Omni Sphatic (Crystal Healing) and EMF Balancing™. I love Energy work! I am founder of Malindi Natural Healing and Teaching Centre™, School of Omni (UK) ™ and UK Omni Association. I wish to thank all the wonderful people who help and have helped, with their love and enthusiasm. I am a member of The Guild of Therapy Lecturers and worked to gain accreditation for the Omni systems and Malindi Centre as registered training school. I have a Teaching certificate from the University of Swansea which enables me to teach at a college or other teaching academy thereby widening the holistic energy horizons. My life mission is being totally dedicated to teach and share with others and to help society find a better way to live. Both Malindi Natural Healing and Teaching Centre™ and School of Omni (UK) ™ are my confirmation that you can reach for your dreams and that they will come true.